There's a little chill in the air these days, which means it's time to break out that soup pot again! 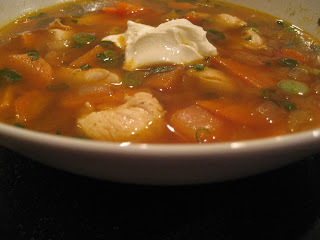 I recently tried Smoky Sweet Potato Chicken Stoup, mostly because I was just intrigued by the idea of a soup with sweet potatoes. And I kind of love sweet potatoes, so that was a factor, too! I tried this recipe and loved it as well. This sounds yummy! I will def be making it next week. Thanks for sharing! I just made this soup. It's delicious! I'll definitely make it again it's perfect for colds and flus.